My name is Danielle Abdon, and I am a PhD student in Art History at the Tyler School of Art and also a summer graduate worker at the Digital Scholarship Center at Temple. I specialize in Late Medieval and Renaissance art, architecture, and urbanism in Venice, and my future dissertation research will explore the intersections of gender, architectural patronage, and charity in early modern Venice. I am specifically interested in the foundation of charitable institutions (hospices, shelters, etc.) in the city, and how these organizations affected the Venetian urban landscape. Additionally, I am also interested in how DH tools can aid in the teaching of architectural history and urbanism. While working at the Digital Scholarship Center this summer, I am creating a digital reconstruction of Piazza San Marco in Venice and its urban development throughout time. My interest in this topic began when I was an undergraduate at Rollins College, FL. At Rollins, I wrote my senior honors thesis on Dogaressa Alucia da Prata Zen, the wife of a Venetian duke who ruled the Venetian Republic from 1253-68. I examined the dogaressa’s involvement with two charitable institutions in the city: the Ospedale di Santa Maria dei Crociferi and the Ospedale di San Marco. The latter was located on Piazza San Marco, but the building was destroyed in the sixteenth century. Since scholars still debate on the location of this institution on the Piazza, understanding the urban evolution of that space was an important component of my thesis. As I became more aware of DH tools and projects, I began to see the potential of a digital reconstruction of the Piazza. 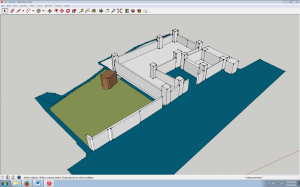 Besides helping me with my research on the precise location of the Ospedale di San Marco, this project will also allow me to familiarize myself with SketchUp, an important tool for digital reconstructions. Most important, an interactive model of the Piazza will show changes in urban space as a fluid narrative, rather than using static maps and diagrams. In order to create these digital models, I will use ten diagrams documenting the Piazza from the ninth until the twentieth century and develop a comprehensive chronology that shows major urban developments in that space. Additionally, I will go over the scholarship on the Piazza to identify approximate measurements for each building. These diagrams and dimensions will then allow me to create digital reconstructions using SketchUp. Once the models are executed, my next step will be to make them more polished using rendering tools. I will also animate them in order to visualize changes through time. As a final step, I will explore different ways to show and analyze these digital models, including augmented reality, interactive walk-throughs, videos, etc. So far, I have created two models of the Piazza in the ninth-century. These are still very rough since I am still working on the chronology and measurements, but you can see below how this project is starting to look like. The main advantage of working with architectural models on SketchUp, especially through time, is that the process really makes you think about the space you are trying to design. For example, you begin to consider how the Piazza would have looked from someone arriving in Venice from the water, who would be able access (or not) certain areas of that open space, how ceremonies would have happened, how visitors would experience the space in terms of sound, etc. As I continue to work on my models, two projects serve as inspiration: Visualizing Venice (http://visualizingvenice.org/) and Virtual Paul’s Cross Project (http://vpcp.chass.ncsu.edu/). If you are interested in digital reconstructions, I highly recommend that you check those out!